If you can do without the MyLink infotainment and 7-inch dash display, the base LS Spark still comes with air conditioning, aluminum wheels, and other standard features that keep it from seeming grim and downmarket--and it starts at just $13K. 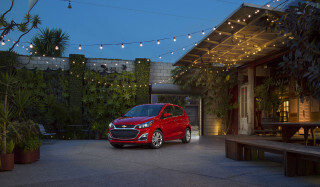 The 2013 Chevrolet Spark is the brand's first minicar, and its five doors open to an interior that seats four adults capably if not luxuriously. It's neither the fastest nor the most fuel-efficient small car, but in tight city streets, it's easy to drive and park--and the smartphone navigation app shows the future of in-car infotainment. Avoid the automatic version, though; it's tragically slow. The 2013 Chevrolet Spark minicar is the smallest Chevy sold in the U.S. in many years. Targeted at Millennial buyers, it's designed to be cheap, cheerful, and digitally enabled for first-time car buyers who find their smartphones more interesting than new cars. 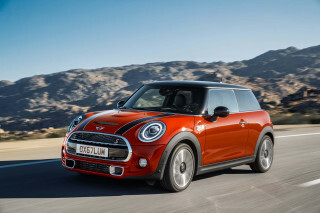 The little five-door hatchback competes with a growing group of minicars that includes the MINI Cooper that launched the segment in the U.S., the new Fiat 500, the Mitsubishi i electric car, and a pair of two-seat entries, the aging Smart ForTwo and the new Scion iQ. Although its 12-foot-1-inch length is exactly 3 feet shorter than a Chevrolet Cruze compact four-door sedan, the Spark doesn't necessarily look as small as it is. Only in scale--parked next to a sport-utility vehicle, for instance--is its true size obvious. The designers have done everything they could to disguise the Spark's proportions. It's a tall vehicle perched on small 15-inch wheels, but accent lines, black-plastic panels that continue the window line, and a large Chevy twin-opening grille help to hide the slab-sided, snub-nosed box-on-wheels look. The handles for the rear doors are hidden in the black plastic trim, which Chevy says gives the car a "coupe-like" look. We don't really buy that, but visually the rear doors don't necessarily read as doors on first glance. While the rear end is all but vertical, a long roof spoiler extends to frame the rear window opening, giving depth to the rear and improving the Spark's aerodynamics as well. Inside, the textured hard-plastic dash makes no attempt to disguise what it is by imitating any other material. Similarly, the seats are unashamedly synthetic cloth. 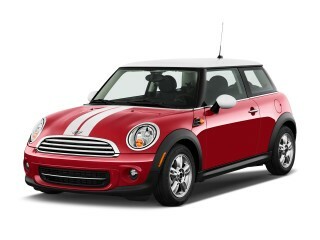 But body color inserts on the door trim, inside the door bins, and on the dashboard add a cheerful accent. They recall the painted interior metal found in economy cars of the Sixties, though in the Spark they're all body-color plastic added for effect. 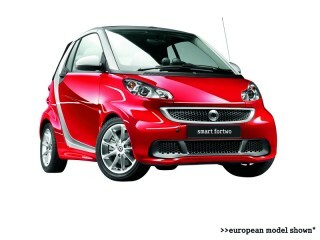 Like its big brother the Sonic, the Spark has a "motorcycle style" instrument pod mounted on the steering column. It contains a speedometer and a small vehicle information display. The base Spark has a small monochrome center monitor, but all LT trim levels feature a 7-inch color touchscreen display in the center stack. 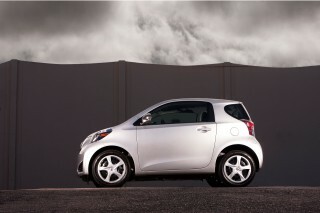 There's only one engine in the Spark, an 84-horsepower 1.2-liter four-cylinder Ecotec that puts out 83 lb-ft of torque. The Spark comes standard with a five-speed manual gearbox, and a four-speed automatic transmission can be ordered for an extra $925. Aggressive driving with the manual can hustle the little Spark through town acceptably, but the automatic is, frankly, a dog. Its first gear is high enough that accelerating away from stoplights seems agonizingly slow, and it doesn't seem to offer much punch at any speed or in any gear. This is one car for which the manual gearbox may be the only viable option. The 2013 Spark with the manual transmission is EPA-rated at 32 mpg city, 38 mpg highway, for a combined rating of 34 mpg--as good as anything in the class, but slightly lower than various larger compact sedans, which benefit from better aerodynamics. 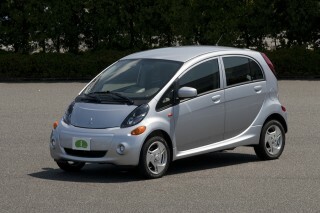 The automatic version comes in lower, at a combined 32 mpg (28 mpg city, 37 mpg highway). The Spark runs on regular-grade gasoline, though; the Fiat 500 recommends premium fuel. The Spark's ride is quite firm, but it handled broken New York City streets with aplomb--even if riders were aware of every bump, pothole, ridge, and ripple. It's tall enough that passengers will feel the Spark leaning on hard corners, but its relatively small wheels and tires worked hard to hold the road. The electric power steering offers some road feel, and while it's hardly as fun to toss around as the MINI Cooper, the Spark can change lanes into spaces other cars couldn't fit into, and it's a joy to park. Our initial drive gave us no chance to test the Spark at 75-mph freeway speeds. Inside, the Spark's seats are manually adjustable but comfortable--if a little narrow for broad-beamed American passengers. The rear seatback is upright, but with a little negotiation between front- and back-seat riders, four adult male humans can occupy the Spark and travel in reasonable space. That's more than can be said for the MINI Cooper or Fiat 500, although the Mitsubishi i electric car--the only other five-door hatchback in this class--offers similarly unexpected rear-seat space as well. With the rear seat up, the Spark has 11.4 cubic feet of cargo space--enough to hold 10 to 12 full paper grocery bags with ease--which expands to 31.2 cubic feet when the 60/40 split rear seat is flipped and folded down. A cargo net is available as part of the higher trim levels, as are rails to mount luggage carriers on the roof. The 2013 Spark has been designed to meet all current and future U.S. safety requirements, and comes standard with no fewer than 10 airbags. It has not yet been rated for crash safety by either the NHTSA or IIHS. The Spark has not only electronic stability control and anti-lock brakes, but also front seat-belt pre-tensioners and standard Hill Start Assist--a nice feature for young drivers. Outward vision is good, including decent rear three-quarter visibility over the driver's shoulder for reversing (no rear-vision camera is offered). All Sparks come standard with GM's OnStar system and six free months of service. Unexpectedly for a minicar, all Sparks come standard with air conditioning, power windows, a rear-window wiper, and a trip computer. And Chevy reasoned that one way to make the Spark appear less appliance-like was to fit every model, even the base cars, with 15-inch painted aluminum wheels--no plastic covers over slotted metal wheels here. In the Spark, the Chevrolet MyLink infotainment system includes an AM/FM stereo with the 7-inch display (Sirius XM can be added), Bluetooth streaming, and compatibility with Pandora and Stitcher apps. No CD player is offered--a first for a current GM car--since its target buyers no longer use them. The Spark is the first Chevy to offer a navigation system that's not built into the car, but runs via an optional $50 smartphone app called BringGo. It compresses the entire North American map database into a 2GB app that runs on the user's smartphone. The company calls the concept "smartphone, dumb radio," and it uses the processing power of an Android or iPhone smartphone to calculate routes that are then transmitted to the car's dash display. Updates to the map data are handled through the app marketplace, and for certain destination searches, the system will warn the user if data charges may be incurred while running Google Local lookups on the phone. Chevy says its Millennial buyers wanted in-car navigation, but compared its cost to running Google Maps on their smartphones--obviously a major hazard for distracted driving. We suspect that once the word gets out about smartphone navigation integrated into the car, the writing will be on the wall for $2,000 in-car navigation systems--at least among price-sensitive buyers. 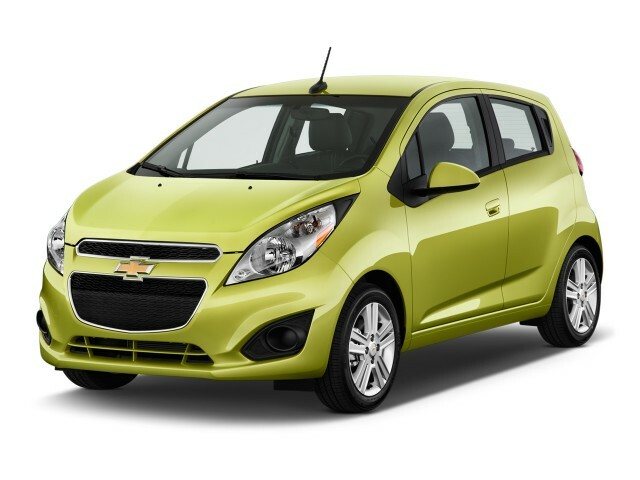 The base LS model of the 2013 Chevrolet Spark starts at $12,995. The next level up, the 1LT model starting at $14,495, adds MyLink with the 7-inch touchscreen dashboard display, a USB port, Bluetooth audio pairing, audio controls on the steering wheel, and built-in Sirius XM radio with 3 months of free service. It also includes remote keyless entry, power door locks, an anti-theft system, power door mirrors, cruise control, and floor mats. The top-of-the-line 2LT model adds to that 15-inch alloy wheels, fog lamps, leatherette seats with heated fronts, a leather-wrapped steering wheel, and several exterior embellishments including silver roof rails, various chrome accents, and a different front fascia design. It starts at $15,795. The Spark's unique color palette includes Techno Pink (a sort of lilac), Lemonade (pale yellow), Denim (pale blue), and Salsa (lime green). Black Granite paint is a $175 optional extra. All Sparks destined for the U.S. are built in South Korea. A mandatory $750 delivery fee will be added to all prices given above. It's just the car I needed, gets me where I'm going and gets great gas mileage.